Have you ever had one of those moments, while enjoying a meal set before you, where you’re whisked off into another dimension? There’s a symphony of flavors and textures playing sweetly, bite after bite. You completely lose yourself in this spectacular combination, and before you know it, it’s OVER! I guess there’s a reason why things don’t last forever. We’d never stop eating with burgers like this hanging around. This right here is the first component of this lovely symphony. I know it’s going to sound weird, but it really works well together. 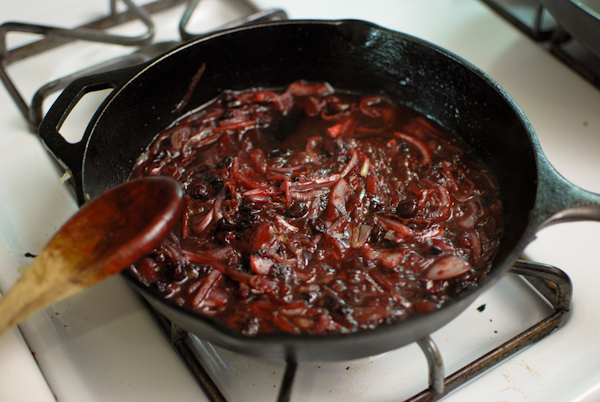 It’s my blueberry / onion compote. …and then the blueberries get added, and cooked until they burst. 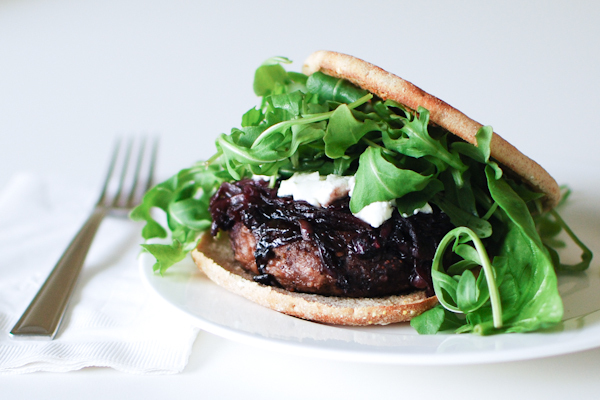 Balsamic vinegar ties everything up nicely, adding a sharpness to this sweet and savory combo. 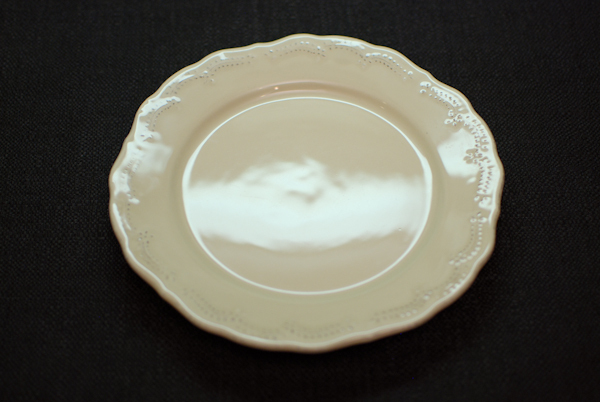 Butter finish. Tadaaa! Season with s & p.
You can use this compote on any grilled meat really… Pork chops, steak, chicken… It’s really pretty versatile! This time, ground turkey was the winner. Winner winner, destruction dinner! 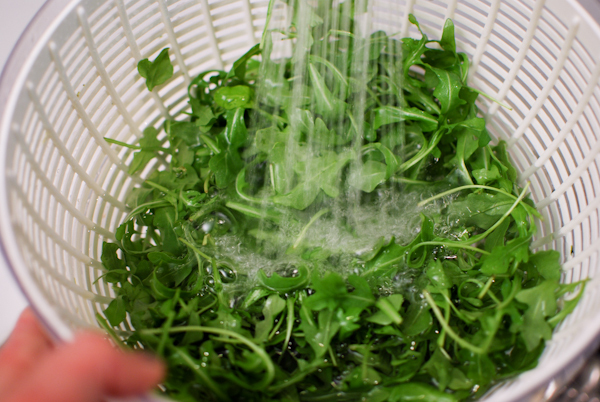 Arugula has been the green of choice around our house lately. 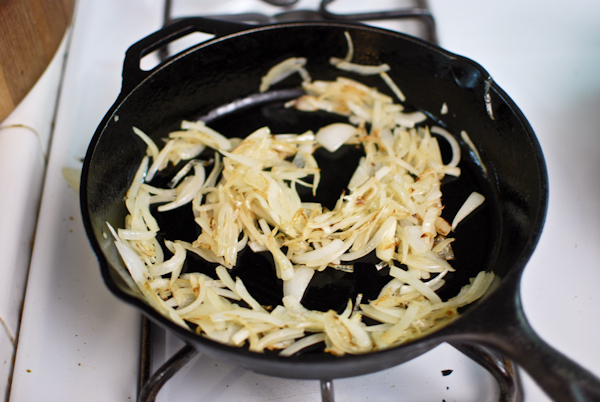 It’s so fresh, slightly peppery, and despite it’s delicate look, has a very firm, nearly crispy texture when fresh. 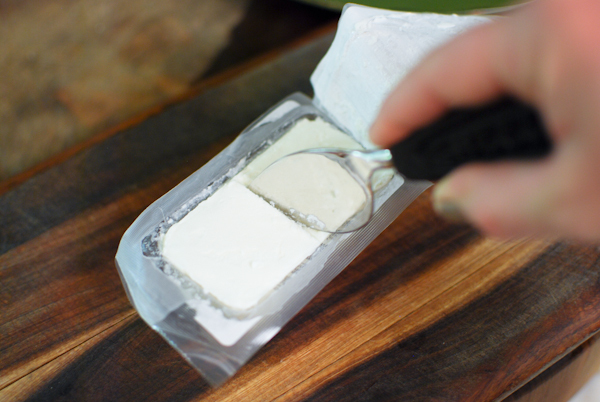 The final touch ends with the goat cheese. 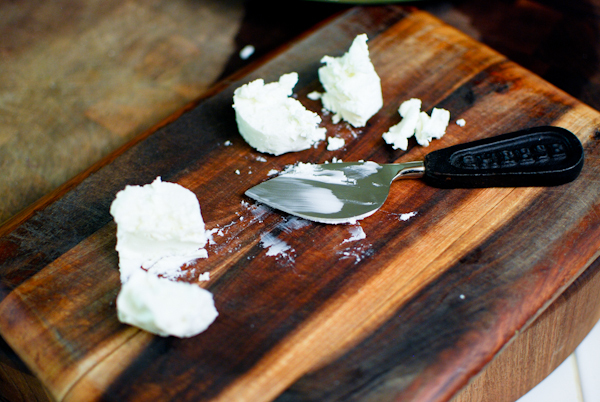 The sharp flavor of the cheese plays well with the sharpness of the compote, but also lends a creamy texture that is to die for! Now that we’ve got all of our components, all that’s left is to assemble! 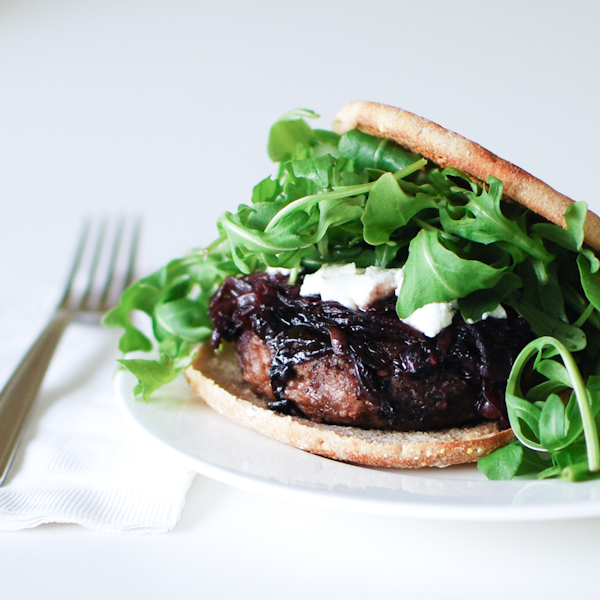 I slid the assembled burger under the broiler for a minute or two, just to give that goat cheese a head start. The only thing missing is a nice cold craft beer. Indulge in the fantastic symphony of flavors! Heat 1 tablespoon olive oil in a pan over medium-low heat. 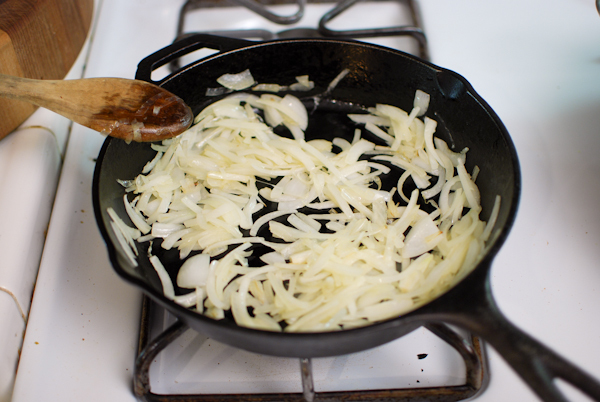 Add in onions, and cook about 30 – 40 minutes, stirring occasionally, until caramelized. 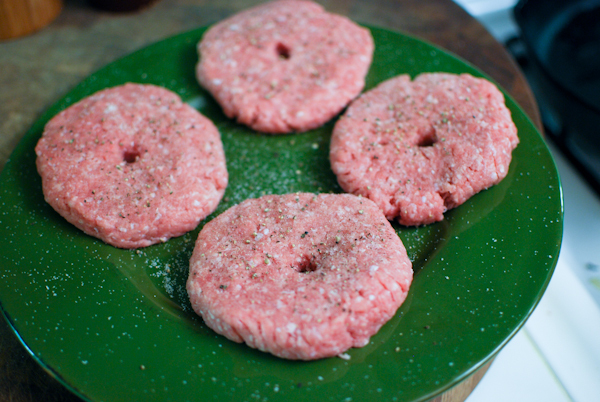 Meanwhile, shape your turkey burgers, season them with salt and pepper, then divide the cheese into four equal parts. 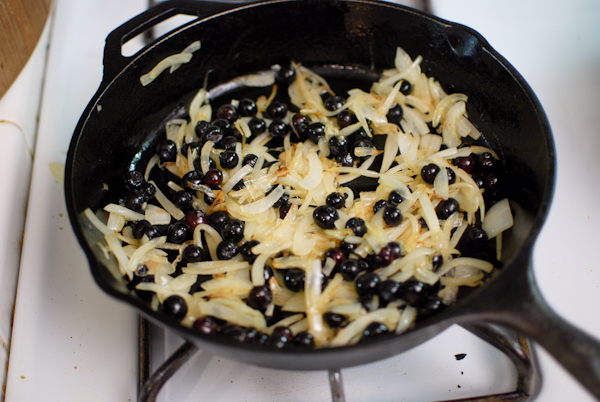 Once the onions are caramelized, season with salt and pepper, turn up the heat to medium, and add in the blueberries. Closely monitor until the blueberries start bursting, about 3-5 minutes, then add in the balsamic vinegar. Keep stirring until the mixture reduces to a thick paste, about 10 minutes more, mashing the berries that haven’t yet burst. Remove from heat, stir in the butter until melted. Heat another pan over medium-high heat, adding in the remaining olive oil. Cook the turkey burgers until done, about 4-5 minutes each side. 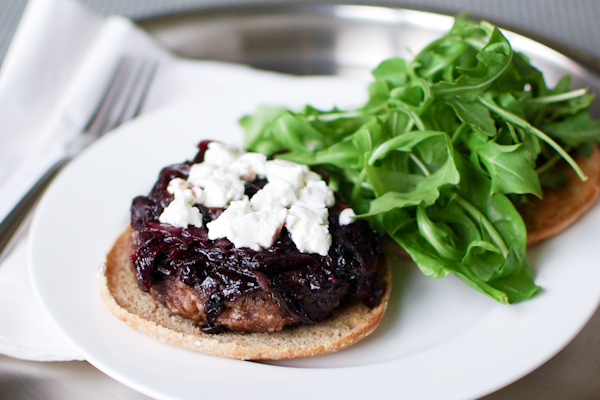 Build your burgers by placing even amounts of the compote on top of each burger, followed by the cheese. You can place the burgers under a broiler at this point to warm the cheese up a bit if you like. 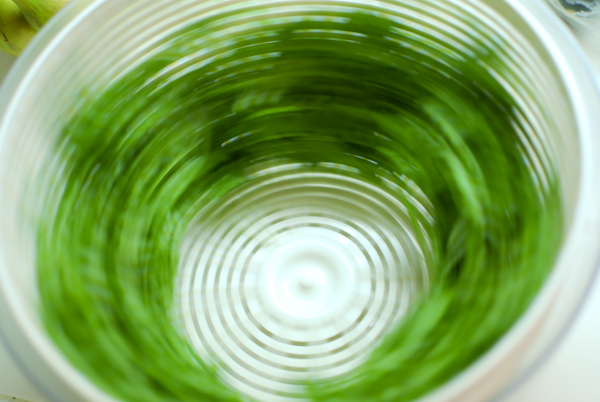 Top with arugula, and enjoy the symphony! Can’t wait to try this…so creative! I’d love to hear what you think of it, Ellen! Thanks! Heck yeah!! I hope you dig it as much as I do, girl!! These were freakin’ awesome. In my 13 year old son’s words “absolutely, epicly, amazing!!! !” My husband said definitely in the make again list. And a little over 5 years later he asked me to make these for his birthday dinner. Still absolutely delicious and we have made them many times over the years. A family favorite. Lisa! You made my day, seriously! I’m so so glad this is a favorite of yours! Cheers, and Happy Birthday to him!! These were yummy! Thank you for the wonderful recipe! So happy to hear you enjoyed them, Alex! 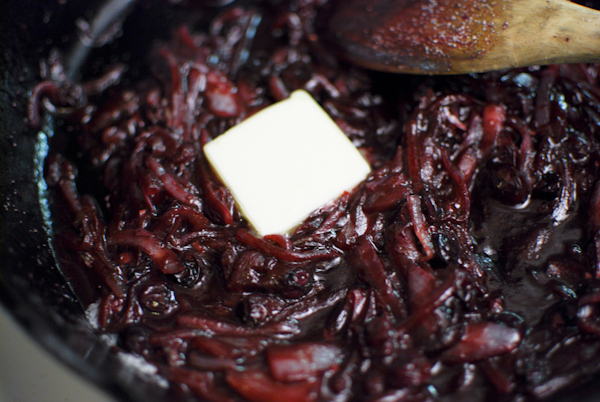 Going to make this blueberry onion compote, Nat. Did you know I live in wild blueberry country? YUM!!! Can’t wait to try it. WILD BLUEBERRIES!?!? Ohhhhh Judy! I’m soooooo jealous! That’s one of my favorites!! 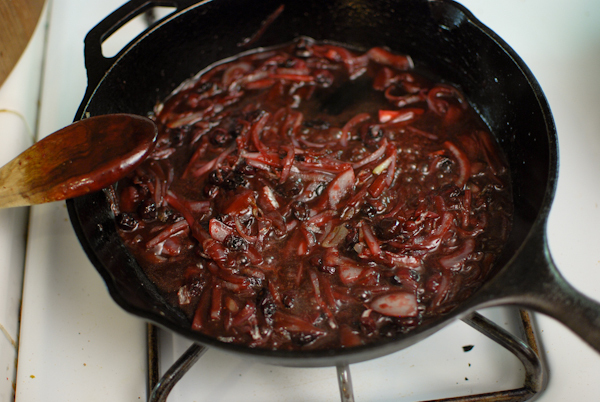 Blueberry Onion Compote is simmering down right now. I love it when all good things come together. Of course my blueberries were frozen. When I saw them in the freezer a few days ago, I thought it was about time to eat them. I was thinking, Blueberry Buckle. Something Grandma used to make. It is made with a little sugar and 3 or 4 Tbls of instant tapioca to thicken then folded into a batch of sweet dumplings. Served up with vanilla icecream melted in on top. Judy, I love beets too! Angel doesn’t so much, but the recipe that he really likes is beet pancakes. PANCAKES! Oh man, they remind me of childhood, and the buckwheat pancakes that my momma used to make. With honey, they are delicious! I also like beets roasted, skinned, and chopped into bite size pieces with thyme, capers, goat cheese, and lemon vinaigrette. So dang good.